The Chesapeake Basin is named for the nation's largest estuary, the Chesapeake Bay. As an estuary, the Bay contains a mixture of fresh and saltwater, creating an ideal habitat for a diverse array of plants and animals. 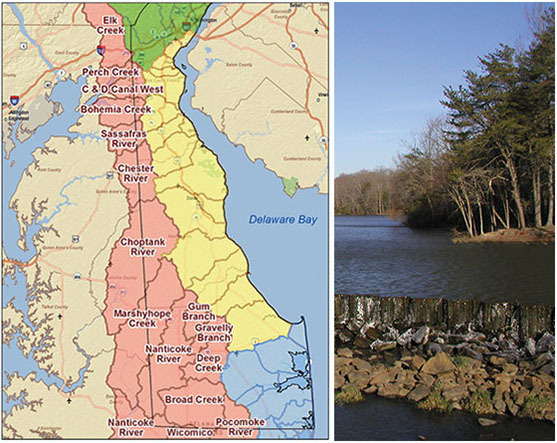 The Bay's welfare is heavily reliant on the land use of the Basin, since Delaware's portion of the Chesapeake Basin contains headwater areas, the area where a waterway originates. The streams and rivers that drain into the Chesapeake Bay support many species of fish harvested for both food and profit. Substantial commercial fishing efforts take place in the Nanticoke River, with American shad, blueback herring, alewife, white catfish, channel catfish, striped bass, and white perch representing the highest percentage of the catch. Many of Delaware's residents and visitors depend on water for their recreation enjoyment. Fishing, swimming, and boating are popular activities throughout Delaware. Delaware's portion of the Chesapeake Basin includes a dozen publically-owned ponds and lakes, comprising nearly 700 acres that serve recreational needs. The health of Delaware's waters will affect the recreation potential of these ponds and streams. Delaware's wildlife represents a vital recreational resource base as well. Both hunting and birding depend on the health of the state's natural resource. More than 90 percent of Delaware's Waterways are considered impaired. "Impaired waters" are severely polluted waters that do not meet water quality standards. The state's list of impaired waters, filed with the Environmental Protection Agency, includes 377 bodies of water that suffer from 11 different impairments, the most common of which are pathogens and nutrients. Most impairments come from nonpoint sources of pollution, which are difficult to control. Pollutants in Delaware waters are often chemicals, such as nitrogen and phosphorus from fertilizer runoff. They can come from specific "point" sources, such as sewage treatment plants, or from "nonpoint" sources, like runoff from lawns, farms, parking lots, and golf courses. Water naturally contains nutrients as natural erosion and organic material degeneration occurs. However, soil erosion, domestic waste disposal, and runoff can lead to an unhealthily high concentration of nutrients in the water, a situation referred to as eutrophication. Eurtrophication occurs when an excess of nutrients, primarily nitrogen and phosphorus, enters the water and causes accelerated growth of algae and phankton, depletion of dissolved oxygen, increased turbidity, and an overall decrease in water quality. Fish and aquatic organisms cannot survive without dissolved oxygen; eutrophication is one of the most serious problems facing the Chesapeake Bay today. The nutrients entering the Bay come from agricultural runoff, urban runoff, and municipal and industrial point source discharges. Poultry is the primary agricultural product in Delaware, and within Sussex Country, the Indian River, Nanticoke River, and Broad Creek watersheds are the main poultry producers. The Broad Creek watershed has the highest density of poultry per acre than any other watershed in the state, causing the Nanticoke River and Broad Creek to have an abundance of manure. In addition to agriculture, septic systems also contribute high amounts of nutrients to the Chesapeake Bay. The Chesapeake Basin has one of the highest percentages, 95%, of land area covered by septic systems. From research done on the Nanticoke watershed, a notable amount of nitrogen loading was found to be originating from septic systems. 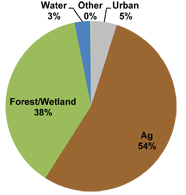 As the soil type and water-table depths in the Nanticoke watershed are similar to the rest of the Chesapeake Basin, similar nutrient loads can be predicted throughout the Basin. Raw or inadequately treated sewage is also a severe contributor to the declining health of the Chesapeake Bay. This sewage contains pathogens, which are disease-causing bacteria and viruses. The potential daily pathogen output from one person's untreated sewage can equal that of treated sewage from hundreds to even thousands of people, depending on the level of treatment. Wildlife and animal operations can also be significant sources of pathogens. High levels of bacteria can cause serious illness to people that eat shellfish, swimmers, and others who come in contact with the contaminated waters. The Basin encompasses a 769-square-mile area of land in western New Castle, Kent, and Sussex Counties. More geological formations exist in the Chesapeake Basin than in any of the other three basins. Delaware's Coastal Plain contains very think sedimentary deposits. These unique deposits were able to form because of Delaware's position along what used to be an extremely active continental plate boundary. Delaware's Chesapeake Basin contains a variety of habitat types that provide homes to diverse flora and fauna. The northernmost forests usually contain a mixture of hardwoods, dominated mostly by oaks, beech, tulip poplar, and hickories on the drier sites. The predominant tree species in wetland habitats include box elder, sycamore, sweet gum, slippery elm, red maple, tulip poplar, ash, pin oak, and sometimes river birch and black willow. The oldest trees in Delaware reside in this basin, reaching ages estimated to be around 500 years old! Moving south along the Chesapeake Basin, a transition in forest species begins. Entering Sussex Country, when the deciduous hardwood-dominated forest gives way to an evergreen forest, you are in the Oak-Pine Forest Region.